In our search for the perfect hunting pack, we’ve come across backpacks with varied features. We’ve seen those with dedicated meat haulers. We’ve encountered the backpacks with massive frames that tower above the wearer. We’ve encountered the packs that are purely just rubbish. However, one that stood out for us is this unique backpack from ALPS OutdoorZ. This is a backpack that’s more than just a simple pack. It goes beyond what you believe a hunting pack should do. It pushes the limits of how far a simple daypack should go. The ALPS OutdoorZ Pathfinder Pack (that’s what it’s called) is a beautifully crafted work of art. That’s the best description we can give it. And ALPS OutdoorZ tells us it was made by hunters for hunters. We believe them. Only a hunter can figure out what a hunter truly yearns for in a pack. And when they set forth to make the Pathfinder, they took all their needs and met them in one amazing pack Enough chit chat, let me introduce you to the ALPS OutdoorZ Pathfinder Pack review. I said it, and I’ll say it again, the Pathfinder is all the needs of a hunter met in one amazing pack. This is a versatile creation. As a hunter, you’ll definitely require a system in which you’ll haul your meat. You’ll also want a pack that will take in all your gear and still has room for a little bit more. And, of course, you’ll want to carry your weapon or weapons conveniently. All this sounds like having to carry more than one pack, right? Wrong! With the ALPS OutdoorZ Pathfinder Pack, everything you need is in this one pack. It starts out its life as a fanny pack. Modest but highly functional. Then, when the need arises, it can effortlessly transform into a daypack. How, you ask? Well, all you do is simply unroll the daypack from inside the fanny and presto! The pack instantly transforms. All this gives you two carrying modes; the hauling mode and bow carrying mode. In the hauling mode, the pack provides space to carry your meat. Now, how’s that for versatility? It’s a fanny pack. No wait, it’s a daypack. No, it’s both. The Pathfinder is whatever you want it to be. But is all this just hype without a proper carrying capacity? No, it’s not. First of all, the fanny pack mode has a carrying capacity of an impressive 800 cubic inches. That’s much larger than most fanny packs out there. Then, you want it to become the mighty daypack. This mode expands the capacity by another 1900 cubic inches. In total, you get a whopping 2700 cubic inches at your disposal. This is more than enough space to accommodate your day’s gear, the weapons and also the meat. Yes, the weight of the pack might prove a burden when carrying. A poorly built backpack won’t care about your back or shoulders. It’ll selfishly transfer a massive amount on the load to you, compromising on your comfort. With the ALPS OutdoorZ Pathfinder Pack, however, this isn’t the case. It’s a well-built pack that puts your needs ahead of its own. With a padded waist belt and shoulder harness, your shoulder and back get a soft place to lay as the backpack hangs. And being able to adjust the harness, the pack’s size shifts to fit your size. By doing so, the weight of the load it bears is also shifted upwards to relieve you from feeling the strain. In effect, the load feels lighter than it actually is, allowing you to carry it further and for longer. It’s as if ALPS outdoorz pathfinder pack weren’t satisfied with the more than adequate carrying capacity. They looked at the pack and thought that there’s more a hunter would want out of such a pack. So, they brilliantly created the Pathfinder to accommodate extra accessory pockets which are bought separately. You can add on a binocular pocket, a camera pocket or a turkey call pocket. And if you feel they aren’t necessary, simply detach them and off you go. With such flexibility, you aren’t stuck with pockets you won’t need, but when you do need them, you can just as effortlessly have them attached. Water is important, isn’t it? You can’t leave for your expedition without it. But when your pack is filled to the brim with gear and accessory, where does one carry the much-needed water? Well, that’s why this pack has a hydration pocket built in. In here, you can put a reservoir and conveniently carry your water. Then, through the port, attach a hydration bladder and ensure you don’t run out of the constant supply of water as you go along. The ALPS OutdoorZ Pathfinder Pack can transform from a fanny pack to a daypack by simply unrolling the daypack from within the fanny. It can haul meat in the dedicated meat hauling space. With the bow carrying mode, you won’t lack space to carry your weapon. The fanny’s 800 cubic inches of carrying capacity is quite adequate for carrying essentials. The daypack has a total carrying capacity of 1900 cubic inches which raises the whole packs capacity to 2700 cubic inches. Having a padded waist belt and shoulder harness makes the pack comfortable to carry. Accessory pockets can be added onto it to carry binoculars, a camera or a turkey call. The hydration pockets and port allow for attachment of a reservoir to keep you supplied with water. The only con we could find with this pack is that it isn’t water resistant. It can ward off small amounts of water, but when it rains in full force, the wetness will seep in. Q: What is the weight of the Pathfinder when empty? A: It weighs just 3 pounds and 5 ounces. Q: What size of water bladder can it accommodate? A: The pack can easily take in a 70ml bladder but a 100 ml one might also fit. Q: Is the backpack breathable? A: Yes it is. You can use it in hot environments, and it doesn’t get uncomfortable to wear. Q: Is the backpack portion detachable from the fanny? A: No, they are permanently attached. The backpack is foldable into the fanny when you don’t need to use it. Q: Where is this pack made? A: ALPS OutdoorZ Pathfinder Pack is a US based company, but they do their manufacturing of the backpack in China. For us to find a con in the Pathfinder, we had to be really nitpicky. The lack of waterproofing isn’t much of an issue as this is a pack meant for a day’s hunting. However, the ability of the pack to transform effortlessly from a fanny to a daypack and back to a fanny is astounding. 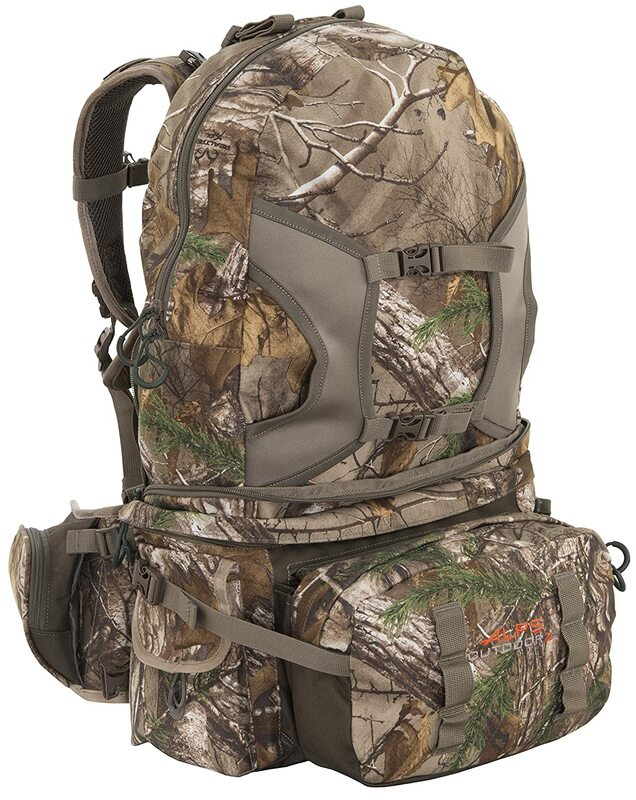 We just love the level of functionality the ALPS OutdoorZ Pathfinder Pack brings to the hunting backpacks world. Add on top of that the comfort in carrying at, and you have a recipe for a winner. This backpack is truly an epic creation.